The strength equipment combination of the Fitness Reality 810XLT power cage along with the Fitness Reality 1000 12 position weight bench can both save you money and provide the versatility you need to extend your work out options. The cage comes with two chrome dual mounted safety bars and two chrome lock-on safety. Each pair of bars can handle a weight capacity of 800 lbs and are adjustable to 19 height levels to give you a total range of work out positions. At the back of the power cage, two rear stability bars are added to provide solid state performance while performing strength training exercises. 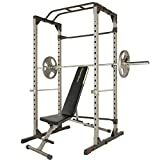 In addition, the power cage comes with the Fitness Reality 1000 weight bench with 12 adjustable backrest positions and an 800 pound super duty weight capacity. Combined with the power cage, you can extend your training routines to over 20 exercise workouts. So, train hard and get the ultimate results you want with the Fitness Reality 810XLT power cage and with the super max 1000 12 position weight bench. Power cage set up dimensions: 50.5" L x 46.5" W x 83.5" h. Set up weight: 133.5 lbs. Weight bench features: set up dimensions: 59" L x 23.5" W x 48.5" h. Set up weight: 35 lbs. User height up to 6'4". incline, flat and decline positions. Backrest adjusts to -20 degree decline to +80 degree incline angles. Detachable 3 position adjustable leg hold down bar for additional stability during workouts. 1.75" thick foam backrest. 10" W x 33.5" L extended backrest. Large seat (15.3" W x 14.5" L). 2 position adjustable front leg. Extended leg stabilizers prevent movement or rocking during workouts. Transportation wheels included for easy relocation. Dumbbells not included. Assembly required. 1 year limited warranty for power cage and weight bench.